Water is the life blood for farming. Make available best water for farming is difficult that means direct from canal or river. For every places its not possible. Almost 85% farmers use bore or well water for farming. Scaling on water pipe line and around water motor pipe, Dripper irrigation line and sprinkler nozzles chock because of lime scaling that means no uniform water supply to all crops. High TDS water burn tips of leaves in farming, Reduce growth of the plant as compare to normal water farming. Damages soil structure. Now Don't worry, GES Electronic magnetic Water Conditioner is the solution for all this , Just install and forget all problems . GES Electronic magnetic Water Conditioner changes the chemical structure of the hard Water. This forces decomposes the molecules into a new form, It just changes molecular structure of the minerals' make it in pure form , so the calcium , iron and other minerals stay in the water but never form hard scale at walls of piping, fixtures, and appliances. These all silent minerals are very much important for crop and human. 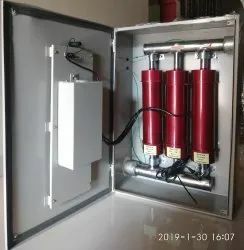 The water coming from GES Electronic magnetic Water Conditioner never form a crusty layer of salt or iron on the ground , these all minerals are more easily absorbed into the ground and the crops, which gives both a healthier environment to grow crops and increases the yield. Hard water from a bore (well) typically has very high surface tension. This water is difficult to be taken up into the plant stem and absorbed into the cell structure. And If it is hard water then it becomes more difficult to be taken up by plant. It is not well absorbed and the result is the plant growth becomes slower. On the other hand any hard water that is treated with Electrical induction GES Electromagnetic Water Conditioner the surface tension of the water is lowered significantly. This then allows the water and minerals to be easily drawn up by the plant. The water provides support and the minerals provide nourishment so that the plant growth will faster and total yield will increase. Water is the life blood for farming. Make available best water for farming is difficult that means direct from canal or river. For every places its not possible. Almost 85% farmers use boar or well water for farming.  No alteration in piping system.  No chemical , No Salt , No Maintenance.  Safe & Easy Installation.  It consumes very little power to operate.  Reduces existing scales build up. 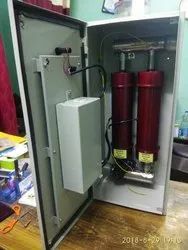 GES uses a series of controlled complex modulating high frequency waveform that ineffective the bonding ability of minerals that are contained in our water. This field effectively control & prevent different size molecules likely to form scale & to break the bonds between molecules & the water. This results the break down of large mineral crystals into tiny mineral particles & then prevent them from reacting with other minerals or bonding to any surface to from scales. The process is so effective that existing scales are progressively broken down & flushed away in due course of time. The conditioned and treated liquid ions results in non-corrosive & best solvent water. It also helps the plants to grow well & healthy. Electro-magnetic treatment is based on the principal of creating an Oscillating field of energy with the use of high frequency radio or square waves. The device produce a unique square wave current that sweeps all the frequency responses from 1000 to 15000 HZ at a rate of 10 times a second. When the strength of the oscillating field varies with time and changes direction an induced current is produced inside the pipe line, this is also known as FARADAY”S law of induction. 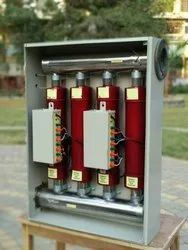 As soon as the water pass through the device or softener, a certain in type of electro-magnetic field in developed in the machine and as a result of that two types of processes are done. During this process high mineral clusters of any size are being broken down into small and tiny particles and scattered. E.g . If any of the mineral ion in the water is in size of 40 micron, then it will be broken down and converted into 10 tiny parts of 4 micron and making them more bion-available. This process is very important in water. When minerals are being broken down and converted in to small and tiny particles, because of that nature of water molecules to travel together and sticking to each other or developing cluster are being ruined and transformed in to 100% non-sticking nature. Like that they cannot travel together or develop any cluster or layer in to water. Nature of water is changed. So with the help of join process of this device hard water is turned into "Best Solvent" compared to non - treated water. This is the only technology which does not remove useful and essential minerals/nutrient ions from water, but treat them and make them more bion-available. Electromagnetically conditioned water results in Super Strength Concrete which is very stable over a wide range of temperatures, high humidity, salty and acidic conditions. Average increase in strength is between 15 to 30%. Increase in density and decrease in porosity helps reduce corrosion of steel inside Reinforced Concrete. EMWC‘s electromagnetic field further breaks down minerals into smaller particles making them more bio-available to the plant cells. The bottom line results are nothing but miracle: maximum hydration of healthy water with greater uptake of minerals results in greater yields, larger and better end product, earlier maturation, longer shelf life, and healthier plants. It allows a reduction of amount of water needed, fertilizer and pesticides. Since the electromagnetic structuring breaks all minerals into smaller particles, salt in the soil is broken down by the structured water, causing it to sink deep into the soil, away from plant roots, and wash away. The desalinization happens quickly over a season, creating much healthier plants, greater yields, and better final product. Since the hexagonal water molecule cluster won’t allow the bonding of minerals to it, electromagnetically structured water acts as Good Solvent which removes scaling from pipes and won’t allow new scaling to take effect. Ø Fit & forget maintenance free. Ø No salt or chemicals needed. Ø No maintenance, easy to install. Ø Mains pressure and flow rate unaffected. Ø Little space required and safe. Ø Low running cost, negligible. Ø Effective on RPVE, UPVC, CPVC, copper , brass , SS304, SS316. Ø No waste of water. Ø Available in 1’’, 1.5’’, 2’’, 2.5’’, 3’’ & 4’’. Looking for Water Conditioner ?